After three months of excruciating negotiations and an insane amount of scrutiny the NFL and the NFL Referees Association have reached a tentative agreement – it only took one of the most chaotic displays of officiating in NFL history during this week’s Monday Night Football debacle between the Seattle Seahawks and Green Bay Packers to speed things up a bit. Lock-out over! Let the football fanatics rejoice! NFL commissioner Roger Goodell provided an apology this Thursday morning saying, “Something like this, it’s painful for everybody. Most importantly, it’s painful for fans. We’re sorry to have to put fans through that.” Goodell said that, as a fan of the NFL, he’d never want to see a game marred by officiating as Monday’s clearly was. Here’s what happened: There were eight seconds left on the clock. Seahawks QB Russel Wilson scrambles outside of the pocket, throws a 24 yard pass in Golden Tate’s direction. Green Bay’s Greg Jennings jumps up in the end zone and catches the ball, Tate also jumps and gets his hands on the ball. The two land on the ground fighting and rolling for the ball. 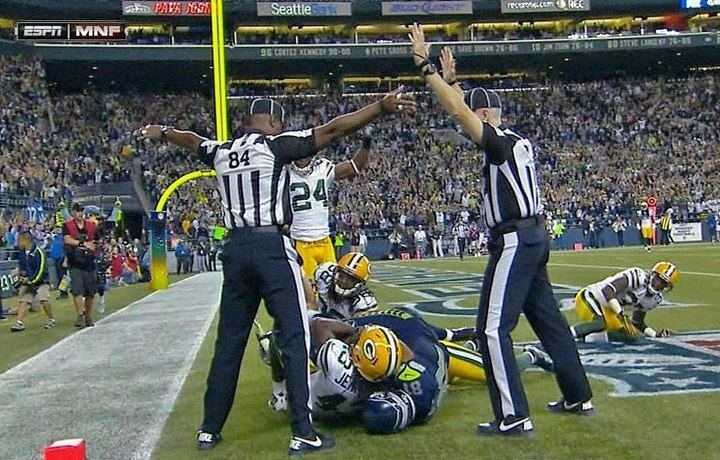 The refs call it a touchdown declaring a win for the Seahawks. HOWEVER before any ball was caught Tate committed some SERIOUS pass interference – which he has even admitted to after watching the replay. The real issue was that the two refs (confused in the photo below) were both blind enough to miss Tate push the crap out of the Green Bay defender. Had the initial correct penalty been called, there would have been no argument regarding the touchdown because time was out. Thankfully, regular union referees will be on the field in Baltimore tonight when the Ravens face the Cleveland Browns. Hopefully they can get things right. The NFLRA were seeking improved salaries and retirement benefits in their negotiations with the NFL during the lockout. They worked out the kinks in the benefits and 401(k) business and also discussed compensation. Who knew pay day was so nice for union referees? Compensation will increase from an average of $149,000 a year in 2011 to $173,000 in 2013, rising to $205,000 by 2019. Sign me up! See ya replacement refs – it’s been real, but it hasn’t been real great. 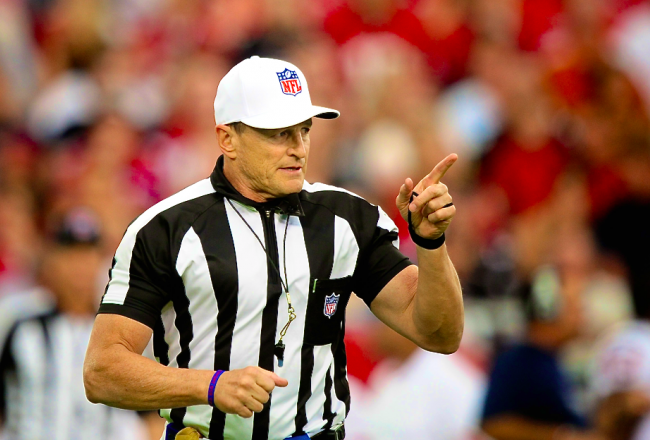 This entry was posted in NFL and tagged ed hochuli, Green Bay Packers, NFL, nfl commissioner roger goodell, NFL referees, NFL Referees Association, NFLRA, Ref lock out, Seattle Seahawks by Marques Says. Bookmark the permalink.